This term fibre is thrown around in the media, in health blogs, magazines and celebrity diets but what actually is it? I’m so glad you asked… Fibre is the edible portion of any plant-based food. Even though fibre is classified as a nutrient, it resists digestion and absorption in the small intestine, and it ferments either partially or completely in the large intestine. Fibre has a unique role in the maintenance of overall gut health and it also is responsible for other sneaky tricks which many are unaware of. Fibre is protective against colon cancer, high cholesterol, coronary heart disease, type two diabetes, obesity and diverticular disease. Let’s explore fibre’s activities in the body and how it is able to be protective against so many conditions. Let’s clear this up, shall we? There are three main types of fibre: soluble fibre, insoluble fibre and resistant starch. Introducing bachelor number one… Soluble fibre. Soluble fibre is found hiding away in the inside part of the plant e.g. the flesh of a fruit. The reason it is called soluble fibre is because of its ability to absorb water and form a gel. When this ‘gel’ material comes into contact with the stool in the large bowl it softens it, allowing one to pass the stool easier. When a person is constipated, passing a hard stool can be very uncomfortable and even painful, so eating plenty of soluble fibre foods should help with this discomfort and also reduce future risk of constipation. However, be sure to drink plenty of water as otherwise you might experience the opposite effect. Introducing bachelor number two… contrastingly to soluble fibre, bachelor number two otherwise known as insoluble fibre, is found in the outer layer of the plant e.g. in the husk or bran of a grain. From its name, it is obvious that insoluble fibre does not absorb water and hence acts very differently to how soluble fibre acts. A defining characteristic of insoluble fibre, is its ability to increase gut motility and decrease transit time. What do I mean by these? Insoluble fibre is quite rough in texture and it acts by pushing along the faecal bulk in the large bowel. 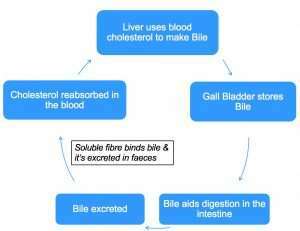 By pushing along or accelerating the faecal bulk, insoluble fibre in turn decreases the time that the bulk is spent in the large bowel. The reason this is important is because our waste and toxins are packed into this bulk and the longer they are in contact with the bowel wall, the more damage they can cause. Although we are after a quicker transit time, we don’t want the other extreme of a super quick passage, as otherwise things like water and electrolyte absorption and other functions of the large bowel will not be able to be performed. This could result in nasty things like dehydration and even malnutrition. Last but certainly not least is bachelor number three… introducing resistant starch. The reason it was given such a name is because it is comprised of (mostly) carbohydrate polymers which resist digestion in the small bowel and is transported to the large bowel where it provides a substrate for either partial or complete fermentation. When resistant starch ferments, it is converted into what are called short chain fatty acids (SCFA). One of the SCFA’s that are produced is called butyrate. Butyrate or, butyric acid provides an energy source for colonic cells. It also acts as an anti-inflammatory agent keeping the colonic cells healthy. Another mechanism of butyrate is cell cycle arrest (stopping the transformation of cells) and apoptosis (cell death) of transformed colonocytes. The way it performs this is via inhibiting the action of histone deacetylase which is an enzyme that affects gene transcription. However, the jury is still out on whether this is in fact protective against colon cancer, so stay tuned! The presence of these short chain fatty acids in the colon causes a decrease in the pH of the colon’s environment. A decreased pH means a more acidic environment. Whilst this might sound bad, an acidic environment causes bile acids to be less soluble and hence less able to undergo metabolism. As a result of this, fat is not fully metabolised or absorbed. As well as this, a more acidic environment allows calcium to become more available to bind with bile and fatty acids. Once bound, these fatty acids and bile are excreted. This process may also be protective against colon cancer. What else can resistant starch do? Another trick resistant starch has up its sleeve is its ability to act as a prebiotic. A prebiotic is a non-digestible food ingredient that stimulates the growth and activity of beneficial strains of bacteria in the colon. The growth of beneficial bacteria improves the health of the host… The host being the human in question. Is fibre ever bad for me? Fibre is never ‘bad’ per say, however each type has his strengths and weaknesses. One circumstance in which a certain type of fibre is advised against, is during a diverticular disease flare up or, diverticulitis. After the age of 65, it is very common for people to develop little pockets in their large bowel. This is called diverticular disease. A healthy diet high in fibre and water is generally the dietary recommendation for this condition. When these pockets become inflamed, it is referred to as diverticulitis. The flare up is due to inflammation, often occurring when little bits of food get stuck in these pockets. 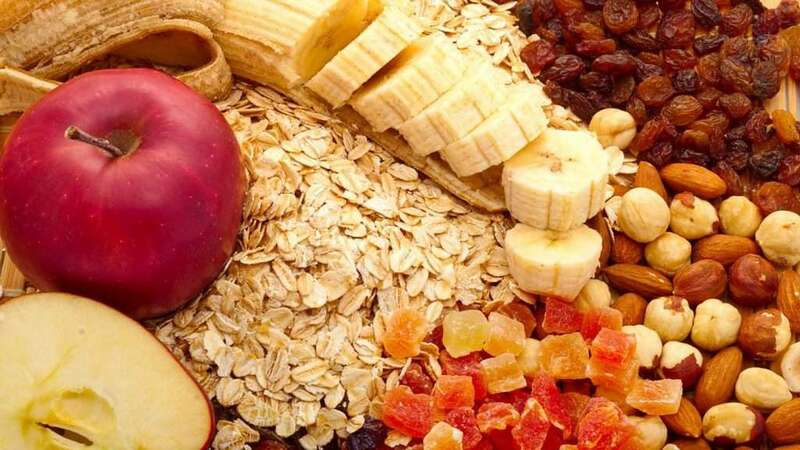 During this flare up, avoiding insoluble fibre foods is recommended as they can get stuck and further irritate the bowel. Once symptoms subside, those insoluble fibre containing foods should be reintroduced. Resistant starch: The content of resistant starch in each food is different as is determined not only by the type of food but also by things such as whether the food has been cooked or not, how much the food has been cooked, whether it has been cooled after cooking as well as by physical manipulation of the food i.e. chewing. How much fibre should I be having daily? In general, adults should be having 25g (women) or 30g (men) of fibre/day.